Sleep is one of the critical needs for human beings, and it affects our health and mood massively so you need to make sure that you do everything you can to make it optimal. 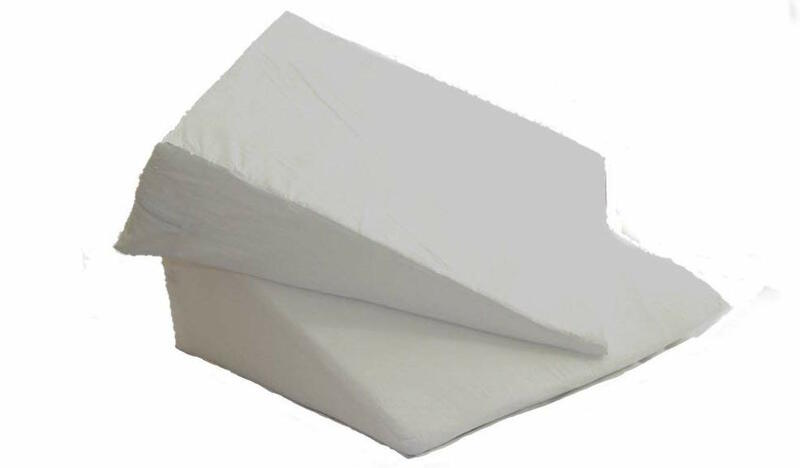 If you’re looking for the best wedge pillow, then you’ve come to the right place as we’ll show you not only the number one product but also a full buying guide to show you the main features and factors you need to consider. You may think that all wedge pillows look the same, but they all have their benefits and drawbacks. There isn’t a one size fits all solution for everyone, but this will allow you to make a final buying decision that’s best for you. This Supportiback bed wedge pillow is your answer whether you’re suffering from neck pain, back pain or acid reflux giving you back the quality sleep you deserve. The pillow is extra supportive to keep your back supported and spine aligned to relieve pressure and pain while keeping your airways clear. The pillow supports you whether you sleep on your stomach, back or side putting an end to piling up regular pillows to keep you elevated. The pillow provides support from your hips right up to your head, as the high-density memory foam contours and hugs to your body. The benefit of memory foam is that it also adjusts to your sleeping position throughout the night, and unlike regular memory foam it has been designed with cooling channels in between the memory foam layers to promote air circulation and wick away moisture from your body. The pillow has a breathable, hypoallergenic cover making it ideal for those that suffer from allergies. The cover can is removable, and machine washable. In addition to each purchase you get a 30 day trial period, so if the pillow is not suited to you, then it can be returned for a full refund. The Loft 25 bed wedge pillow ensures that you maintain a perfect posture while you sleep; it can even be used while you read or watch tv. The filling is made from firm flex foam which has a zipper so you can easily remove the cover for cleaning. The cover is made from high-quality polyester and cotton and can be machine washed to keep it fresh. We know a lot of people pile up their regular pillows so they can be elevated but you no longer need that with this wedge pillow. The pillow is also extremely versatile and can be used in two positions so it can benefit other body parts. For pregnant women, it also works as a maternity support pillow and can also be used to elevate the legs to reduce swelling in the area as well as aches and pains. The pillow is manufactured in the UK and measures 51cm x 46cm x 28cm and the memory foam contours to the shape of your back, neck, shoulders and head until you have finished sleeping on it, then it returns to its original shape. Memory foam is extremely durable so will last many years before it loses shape and needs to be replaced. 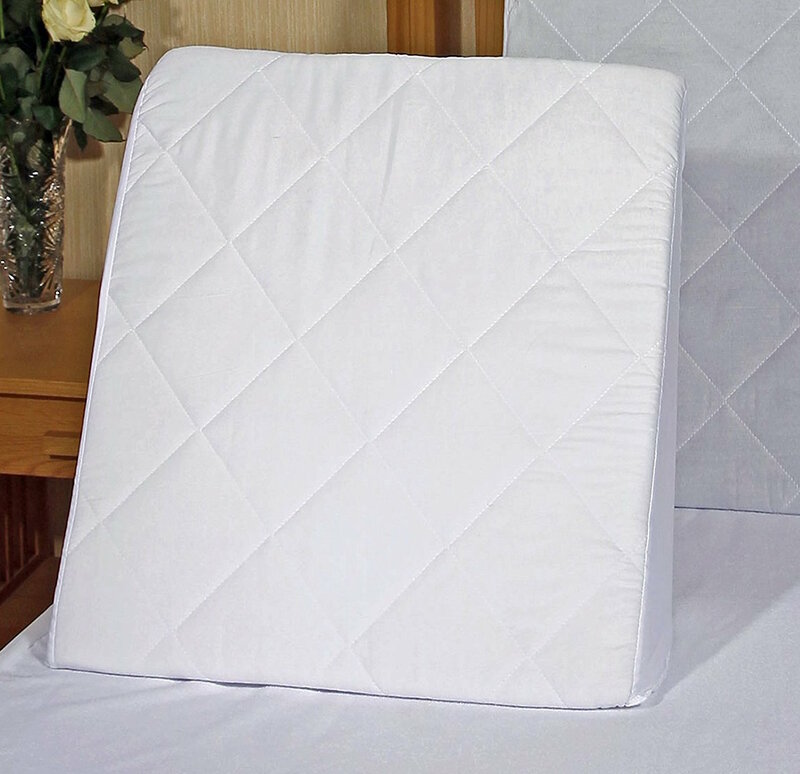 This Comfortnights bed wedge pillow is a high-quality purchase for those who are confined to their bed for long periods which includes pregnant women, back pain sufferers, seniors and those with acid reflux. The wedge pillow has an inbuilt incline which can replace up to 4 pillows and has a unique 2 in 1 design giving you a steep angle and a shallow angle depending on your needs. The shallow incline is more suited to when you’re lying down sleeping, whereas the steeper incline is better when you’re sitting upright watching tv or reading a book. The measurements of the pillow are 51 cm x 46 cm x 28 cm and come with a lovely quilted removable and machine washable cover. If you suffer from swollen ankles, tired feet or aching legs, then you can use the pillow to raise your feet which will increase blood circulation away from the area to reduce the pain and aching associated with these conditions. Care Direct has created a bed sleeping wedge that gives you elevation while you sleep, made from firm foam to contour to your body to relieve pressure and hugging to the shape of your weak joints. Sleeping flat on your back can cause disorders such as acid reflux to get worse because your stomach and throat are at the same level angle, so it's easier for stomach acid to travel up your throat which leads to heartburn. This sleep wedge is also effective for those who have Fibromyalgia and the pillow can be used directly under the person or can be placed under the mattress. You can also use the pillow to elevate the feet and legs to relieve pressure from the leg veins due to encouraging blood to flow from the legs and around the rest of the body. The pillow measures approximately L80cm (31") x W66cm (26") x H12cm (4.7") and can be used for a whole range of additional things. Some users have used the wedge to avoid rolling out of bed by placing it on the side of the bed that you’re prone to rolling out of. It gives you that added safety precaution. The pillow is covered in a polycotton quilted cover that is machine washable. babyREFLUX is one of the largest suppliers of reflux equipment across the globe and produce their products using high-quality materials that meet BS7177 standard requirements. They also supply to the NHS and are tested to UK Orthopaedic standards so you can trust their overall quality. If you’re suffering from reflux, indigestion or breathing and or respiration-related conditions, then you may be finding it hard to get to sleep. This wedge pillow is here to solve your issues by elevating and supporting your upper body when you’re in bed. The pillow is supplied with removable zip off cover which can be machine washed, while also being hypoallergenic, so it's suitable for asthma and allergy sufferers. The pillow measures 64cm x 62cm x 20cm, and if you’ve never used a wedge pillow then it may take a little bit of time to get used to using it. This pillow also promotes the clearing of your airways which leads to fewer blockages so if you suffer from snoring this will work as a remedy. Wedge pillows are different from regular pillows and have a triangular shape which elevates your head position when you sleep. This altered sleeping position can help to treat a range of sleeping disorders that you may be suffering from. They are usually made from foam and cut at an angle, which starts higher and the top and tapers down to a smaller and thinner edge at the bottom. This angle allows for gravity to take effect to drain sinuses, keep the airways clean, reduce acid reflux and keep stomach acid down. Wedge pillows raise your head several inches which makes it easier to breathe while you sleep. This opens the air passages which allows air to flow more freely and be less restricted, so snoring is reduced. The elevated position that the wedge pillow puts you in restricts stomach acid from going up your oesophagus while you sleep. You’re more likely to suffer from acid reflux if you sleep traditionally without the elevation. A wedge pillow has the added benefit of improving circulation if you place the cushion under your knees while you’re laying down. This helps tired and sore muscles recover quicker because more blood is supplied to the tissues bringing nutrients to help them recover. 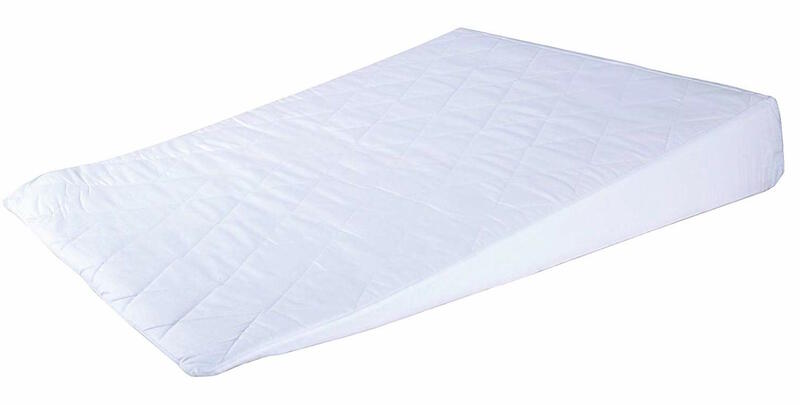 The best sleeping wedge will provide additional support to the shoulders and neck of side sleepers. This is because the pillow allows you to sleep in a natural position leading to a more comfortable and uninterrupted sleep. Back pain is one of the worst disorders to have and can massively affect your sleep. A bed wedge can provide excellent support for your spine and surrounding muscles to relieve aches and strains. Putting the wedge in different positions will target different parts of the back, for example positioning the wedge under the knees will target the lower back. Wedge pillows give you added comfort and relaxation even when you’re not asleep because you can use them while you read or watch tv. The pillow will make sure that your head and neck stay in a relaxed position easing pressure and pain. Wedge pillows aren’t just for the back and can be used for the legs and knees to target other vulnerable body parts that may be suffering from pain or aches. The pillow can be used in a range of different ways. Because they are light and portable, it means you can travel with it or use it outside of the bedroom including camping, aeroplane flights or just in the living room. If you’re regularly watching TV or reading, then you can alter its position, so you’re more upright rather than leaning against the headboard which provides little comfort. A firm but comfortable wedge pillow will provide added support to a woman’s spine that has to bear the strain and weight of the baby through pregnancy. This will give you a better quality of sleep, and the pillow can continue to be used after birth as a nursing pillow either underneath the baby or under the mother so you can stay upright while caring for the baby. You need to be aware of the pillow filling that best suits your needs. Memory foam wedge pillows are the best filling because they support your head and neck while contouring to your body to keep you comfortable and cosy while you sleep. If you suffer from allergies, then you need to make sure that your desired pillow is produced with hypoallergenic materials. A removable cover is also necessary not only so you can easily keep it clean but also replace it when it gets worn. A common mistake that’s often made is buying a wedge pillow that is either too steep or not high enough to fulfil their requirements. People with acid reflux routinely see it because they make the wrong assumption that the higher inclines will cause less acid reflux. A steep incline can cause issues such as sleep apnea whereas a low incline will not fulfil its purpose. The best pillow wedge should have an incline angle of 30 to 45 degrees. Many wedge pillows come with an extended guarantee, so you have a period to trial the pillow before deciding if it’s right for you. People sleep in different positions with the most popular being on the stomach, back or side. 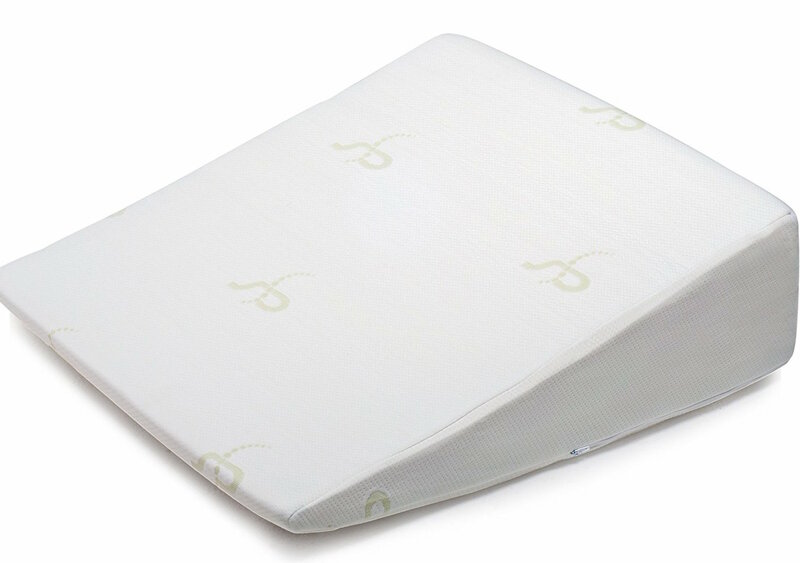 If you’re a front or back sleeper, then the most suitable wedge pillow will be a softer, thinner pillow. 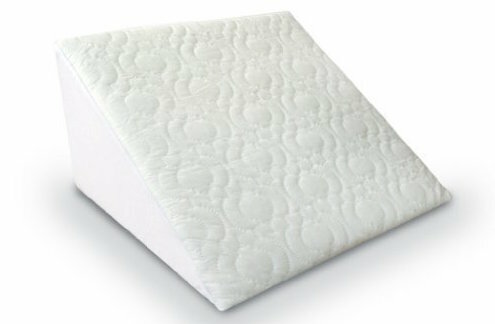 Whereas if you’re a side sleeper, then you’ll need a firmer, thicker pillow as you’ll need more support. Because there is no one size fits all wedge pillow solution that’s best for everyone, the majority will come with money back guarantees. This essentially allows you to trial the pillow, and if it’s not for you, then you can return for a no questions asked refund. Also, there also may be extended warranties, so if defects develop with the product, then you can return to the manufacturer for a refund or new replacement. The brand of pillow you buy plays some importance because there is some degree of correlation between the brand and the quality of the product. Brands that have been around for many years have built a reputation for long-lasting products just like their business. However, newer businesses often bring innovation to an existing market and add new useful features to their products. The higher quality wedge pillows will be more expensive because they have more features, better build quality and have greater longevity. A cheaper pillow will often be made with more inexpensive materials meaning it won’t last as long so, in the long run, you end up spending more compared to just buying the higher quality pillow. Wedge pillows come in a range of different sizes. This is an important consideration because you need to ensure that it fits the size of your bed. For example, if you have a king size bed, then you have more room for a bigger wedge in comparison to if you sleep on a single bed. Also, if you share a bed with another person, you need to ensure that it doesn’t encroach on their sleeping space. So now you’ve seen how many things you need to consider to ensure that you buy the best bed wedge pillow to suit your needs and also the vast range of disorders that it can help to treat. There’s no reason to suffer from reduced sleep when there are specialist pillows and solutions to help you through it.